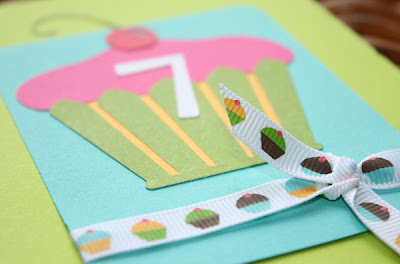 These were made using some Colorbok papers with a Quickutz cupcake die and American Crafts cupcake ribbon. I lucked out on the ribbon and found the last roll at my local Michael's, it was just enough to finish 10 invitations. 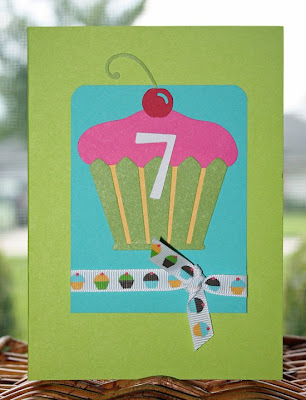 The number "7" was cut using my Cricut Cuttin' Up cartridge. 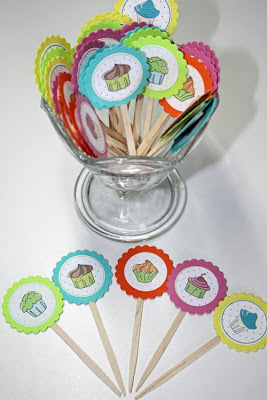 Next up are some cupcake pics I made using a download from a website that I printed a long time ago...I'm sorry, I can't remember where they're from. I glued them onto some "craft picks" that I picked up at Michael's for 25/cents on their clearance table. 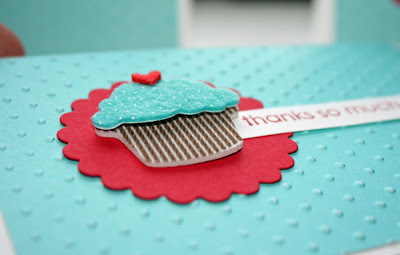 I also used the small scallop die from my Spellbinders set. 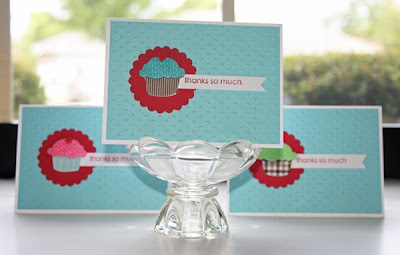 And, last for today are the Thank You cards that I've already made using my Swiss Dot embossing folder, some clearanced cardstock from Michael's and a package of Martha Stewart cupcake (feltie) stickers. I also used the Trendy Trees stamp set from Stampin' Up for the sentiment. I love the felties because they already had dimensional stickers on them and that meant less work for me!! I'll be back with more....we've got a few other things planned for the girls and I'll be sure to share everything! Take care!